Alihan Demir (30) goes up for a monstrous slam dunk against UNCW. The Dragons ended up getting the win 69-57 (Photograph by Isabella Mancini for The Triangle). 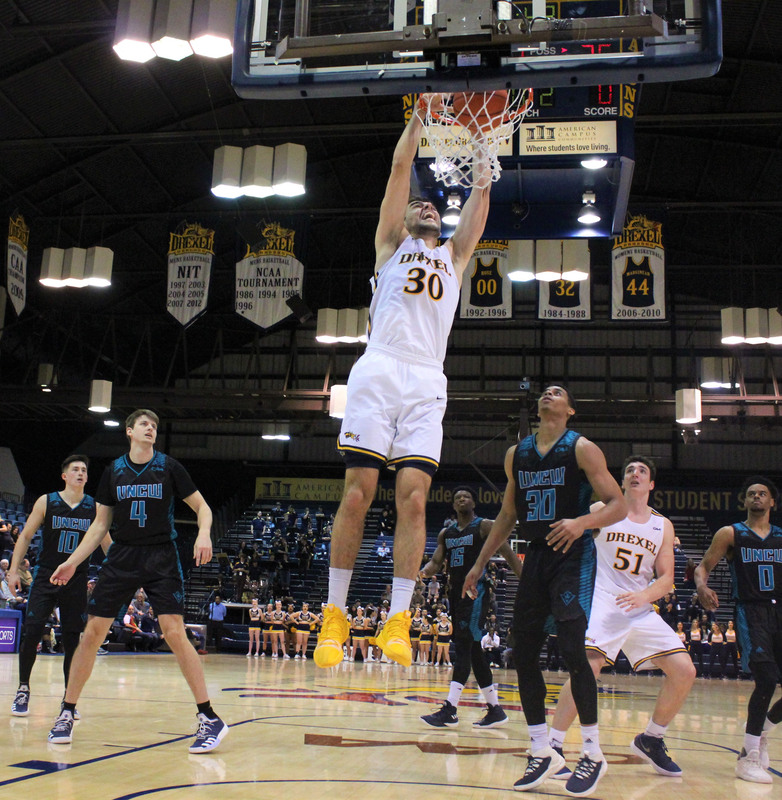 The Drexel University men’s basketball team has continued to impress audiences with their powerful comebacks and strong performances against some competitive teams in the Colonial Athletic Association. As of Feb. 4, the Dragons were fifth in the CAA standings. If they can keep this up, they will be going to the CAA Championships, which begin March 9 in Charleston, South Carolina. If they can stay in the top six, they will receive a bye for the first round of the championships. After losing to the College of William & Mary Jan. 31, the Dragons bounced back to take down Elon University, Feb. 2. The Dragons took their second win against Elon this season, 67-63. To open the first half, Elon’s Chuck Hannah got the ball and attempted to shoot a three. Drexel freshman Camren Wynter got the rebound and passed it to graduate student Trevor John who sunk a three-pointer just 15 seconds from the starting whistle. Elon tied it up with a three from Nathan Priddy. The Dragons kept control of the game until there were 4:25 left in the half when Elon tied it up at 24. Drexel finished out leading into halftime 31-27. Wynter led the Dragons in points in the first half with eight and also added three assists. The Dragons only shot 37 percent from the field but outplayed Elon from beyond the arc and hit 6-7 on free throws. For the first six minutes of the second half, the Dragons went 4-5 on three-pointers to increase their lead to 12 points. Junior Alihan Demir scored the first just over a minute and a half into play, and after a foul on sophomore James Butler that gave Priddy two free throws, John followed with a three of his own to put the Dragons up 37-31. The lead increased to nine as John hit another three-pointer off a fastbreak play. A little over a minute later, Wynter hit a three off a pass from Demir and increased the lead to 47-37. Butler hit the three with 14:21 to go, giving the Dragons a12-point lead. Elon battled back and got within two points of the Dragons with only 54 seconds left to play. Head coach Zach Spiker called a timeout to bring the team together. With just 10 seconds left, a foul was called on Hannah that sent John to the line for two free throws. He made both of them, which sealed the win for the Dragons. Overall, it was a pretty low scoring game for all players. Three Dragons scored over 10 points. John had 14 points and added three rebounds, Wynter had 13 points and five rebounds and Demir had 12 points and four assists. Redshirt freshman Tim Perry Jr. grabbed 10 rebounds for the Dragons this game and Butler had eight. The Dragons shot 10-22 from three-point range and hit 9-12 on free throws. For his great performance against Elon, Wynter was awarded the Drexel School of Education Athlete of the Week Feb. 4 alongside junior Bailey Greenberg from women’s basketball. The men’s basketball team came back home to host the University of North Carolina Wilmington at the Daskalakis Athletic Center, Feb. 7. After losing to UNCW Jan. 10, the Dragons were hoping that they’d grab another win. The teams were neck-and-neck from the very beginning. The first half ended with Drexel up 23-22 after Harper made a three-pointer with seven seconds left. UNCW got a layup right at the start of the second half, but Drexel regained the lead and held the lead until 11:29 when UNCW made a comeback to keep themselves in the game. The Dragons widened the lead again to seven with about six minutes left to play. By the end, the Dragons were definitely in command and won their second-straight CAA game with a final score of 69-57. The men’s basketball team will host the College of Charleston Feb. 9 at 4 p.m.